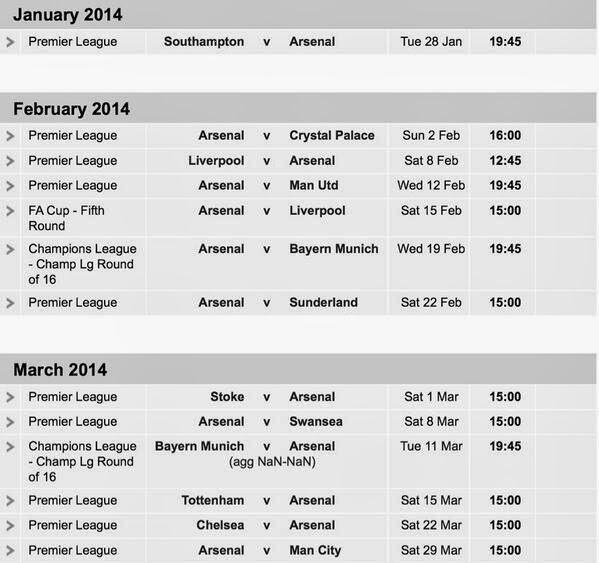 After the FA Cup 5th round draw, Arsenal's February and March schedule is very tough. In February, the Gunners will play Liverpool at Anfield in the Premier League, before playing three home games against Manchester United (Premier League), Liverpool again (Premier League), then host Bayern munich (UEFA Champions League). In March, Gunners will play Bayern Munich away in the Champions League, then visit Tottenham Hotspur before playing Chelsea at Stamford Bridge and facing Manchester City at the Emirates. Well, if you are a top team and you want to challenge for trophies, you have to play these big matches.